The Cyclo Knitter is a bicycle-based machine by design student George Barratt-Jones. The contraption is made from a simple combination of wood and bike parts, and allows one to knit a scarf through light exercise. Barratt-Jones came up with the idea one day while waiting for the train in Eindhoven. His invention allows other riders to stay warm while passing time on the platform, and step away with a winter accessory. If you like this creative knitting mechanism, check out the Rocking Knit, a rocking chair designed by Damien Ludi and Colin Peillex that converts rocking into knitted hats. All photographs by Malou Evers, Erwin Martens, and Werner Pellis, courtesy Corso Zundert. 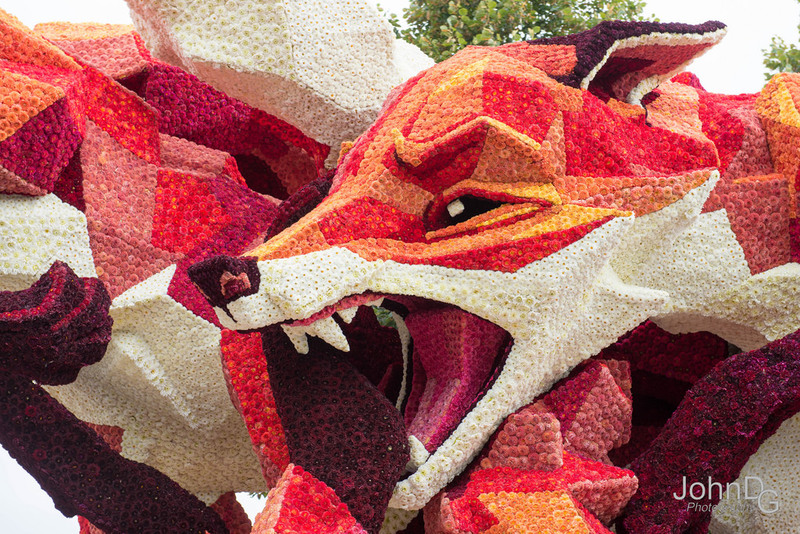 Founded in 1936, the annual Corso Zundert parade is a celebration of the Netherlands’ most iconic exports: flowers. The event is held every year in the small town of Zundert where 20 teams of volunteers from different hamlets compete for the best designed parade float. More than being covered almost completely in vibrant dahlia flowers, the float designs often incorporate moving elements and are accompanied by marching bands and other performers along the parade route. This year’s winner titled “Dangerous Transportation” featured a giant dragon and was designed by the Tiggelaar hamlet. You can see a full listing of all 20 parade floats here. More photos of the 2016 event were shot by John DG Photography, and you can watch a video of the entire parade below. See our coverage of previous years: 2012, 2013, 2014, and 2015. 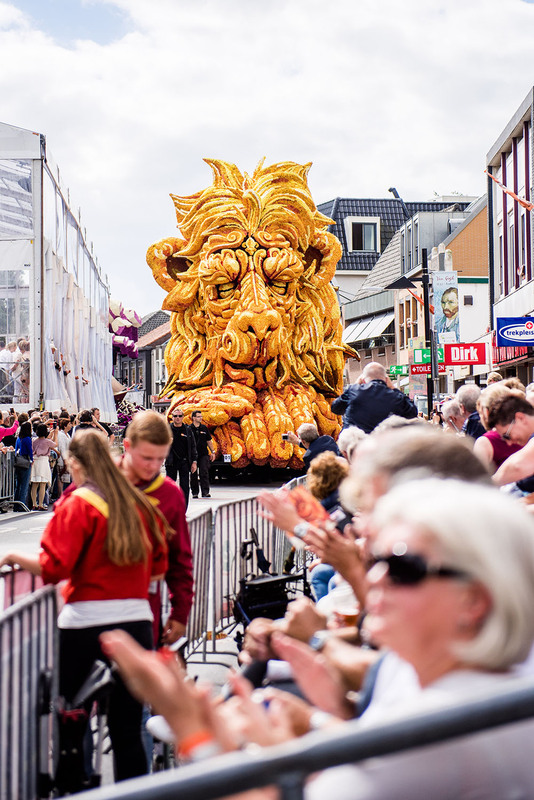 Another year, another Corso Zundert (previously), the legendary parade of giant floats adored with thousands of dahlia flowers that twist through the narrow streets of Zundert, Netherlands. This year 19 teams took inspiration from the work of Vincent van Gogh who was born in Zundert 162 years ago. The towering floats borrow colors, motifs, and imagery from van Gogh’s painting including several interpretations of the artist’s self-portraits. Started in 1936, the parade celebrates the region’s reputation as a global supplier of dahlia flowers, an area now covering 33 hectares (81 acres) of 600,000 dahlia bulbs in fifty different species. The first Corso Zundert parades were modest in size featuring horse-drawn carts or bicycles covered in flowers, but the event has since grown dramatically. The floats now merge more ambitious aspects of contemporary/urban art with traditional parade floats as part of a friendly annual competition. You can see plenty more photos over on BN DeStem. Nearly six months in the making, this superb interpretation of the Netherlands coat of arms was lead by Moldova-based Beauty & the Beast Studio. Illustrator Ivan Belikov rendered the 7-color emblem which was then translated into hundreds of cut fragments that were painstakingly assembled into multiple levels. This is just a glimpse of the final piece, you can see more plus lots of process photos over on Behance. Update: Many readers have written in to point out this piece only vaguely represents the actual lion appearing on the Netherlands Coat of Arms. We’ve updated the title to reflect this.